A recent editorial published in Khaleejtimes.com fuels the debate again between those of us who respect the “hijab” as our identity and those of us who want to simply be our “normal selves”. The editorial by an American Muslim convert highlights the Ahadeeth (sayings) of the prophet (saws) regarding women who decide to chose an alternate path to modesty as prescribed in Islam. The issue I believe is not that whether women who choose not to wear the Hijab or dress modestly understand the Isalmic commandments, but rather has to do with the levels of faith. If you have faith (also called “Iman”), you will respect that faith and Iman (by following the commandments of the prophet and Quran). If you don’t, you will simply adopt other belief systems that would overtake the faith of Islam. Those other belief systems, for example, empowers the non-Hijab Muslim women to adapt the new change. Again, it’s all about the level of faith and this concept applies to all walks of life. You opt to do certain things depending on the depth of your belief and commitment (unless you are being forced in some ways). Source: Why do we need to change the way we look? How to perform wudu or ablution? thanks for raising this subject. I am a recently converted sister who is greatly troubled by the fact that the hijab in my country (Netherlands) is the best way to block Dutch people from ever wanting to hear about the beauty of Islam. They are so shocked at its view, especially when worn by “one of their own people”, that it puts them in a state of total irreceptiveness for whatever positive thing such a sister may wish to say or do. A real wall, yes, a real hijab in the basic sense of the word. The problem is, that I cannot live with the idea of having Islam alive in me and then not being able to share it with my “people” – by this I mean : the people amongst whom Allah has willed me to be placed by birth, no doubt along with the purpose of being able to shine His light towards them. So now, I am looking for a kind of dressing that responds to the original purpose of the hijab, which I do not understand to be to seclude women from playing a positive role in society, but to help preserve the moral standards in the society they live in. And no, I do not think that hiding in one’s home, dedicated to the sile purpose of raising the children, is something that can honestly be called the best way to support the above idea in my country. First of all, how can a woman who does not have sufficient contact with the society she lives in, educate her children to the point where they feel confident muslims ànd valuable citizens who have all the chances to contribute to the islamisation of the society they find themselves in ? What I see all around me, are children who do not know which world they belong to – their parent’s one which only exists in their home and those of family members/other people who adhere to the same system, or the one they have to learn how to function in so that they will be able to get a job when they grow up ? And I see the question in their eyes : why do we have to go for the less responsible jobs here ? How are we ever going to reach a place where we can ourselves influence this society if we keep being held apart form its most important structures, by our own standards ? Secondly, how can we safeguard the values of a society by hiding ourselves completely from it, when in fact our task here is not so much to safeguard as to actively rebuild ! Who is going to re-introduce the values this society has lost, due to an ill comprenhension of the true mission of the prophet Jesus as (which would have been a great opportunity for them to also be able to appreciate prophet Muhammad saws and his message, which is essentially the same but much more to the point as found in the Qur’an) ? Is it not us who have to do that ? And is it not absurd to state that the brothers alone should have that task ? Is it not also the Dutch women who put the islamophobic ideas in their children’s heads (and worse : into their hearts) ? And do we really think that the muslim brothers should now “en masse” start talking to the non muslim women about the blessings of Islam, in the streets and when picking up their kids form school ? How are they going to manage ? I think it is the sisters who have to pick up this task very seriously, and wear the other hijab first, the one that prevents moral decay and promotes moral uplifting – that one is not made of cloth, and even though it does imply modest dressing, it does not imply going as far as being so obstinate in one’s way of applying what is acceptable elsewhere (in a society where everyone agrees upon the suitedness of full cloth hijab as well, and where people not only respect women in spite of not seeing much of them, but rather more so) and then accusing the non muslims of “fixed mindedness, stubbornness, etc.” without considering their sickness of heart that inderlies this reaction. And I do not mean irremediable sickness of heart, I mean the one that can be mended by having had a chance to see compassion in our eyes and our behaviour. Do the people in Holland not have an equeal right to be considered when being led to Islam ? Those who might be eager to accept it if only they were to see its real light, and not the one they are constantly overshone with by the media and the false accounts of history their mind is impregnated with when they are young and innocent children who are not even allowed to speak up when they do not agree with a certain message at school, because in answering otherwise then the school book says, you definitely mess up your chances of getting a good test result ? Where is our compassion ? Bloqued by a sheet of cloth ? That would really hurt ! And I believe that Islam was brought upon us as a blessing, not to make us suffer. And that is why many people in the West do not even want to consider Islam for a brief second : if becoming a muslim means I am throwing myself out of society and making it impossible for me to share its inner richess with those around me who would eagerly drink it, then why should I even bother to ask myself what it really is ? Salam to all, hope to get only serious answers, those who can help to build opportunities for the touching of lost hearts with Allah’s mercy, not those who say “well sorry, if Westerners’ hearts are so sorrowful, they should make a bigger effort to heal themselves to the point where they can see the light” … which sick and afraid person who has been abused so many times before, can learn to love the stick he thinks is going to whip him ? ah ! maybe some people don’t know … but I tell you : the non muslims are suffering severely, and doing all they can to cover it up by throwing themselves at this or that great worldly enjoyment … but doesn’t he (or she) that sees has a big responsibility here to learn more about that person’s hidden suffering, and to learn to speak the language that will lead him to lift up his head, showing a blink of new hope in those eyes filled with frozen tears ? Would you want to feel guilty of not having helped to share the wonderful experience of direct contact with your Creator with such a person, a soul that has come to this world the same as you have, but then in a different setting ? Why do we have parents that teach us different things ? So that we can grow to hate or neglect, reject each other better ? Or so that we can learn to grow the courage needed to overcome these obstacles and join up despite of them ? Can you see yourself happily enjoying paradise incha Allah whilst seeing your neigbour whom you chose not to help overcome his prejudice (which he did not call for himself, but which was forced on him by others in a state where he himself was not strong enough to counter) “joyfully” burn in hell ? Whow – I would greatly admire a person who is able to stand such an ordeal without blinking – I certainly would not ! that every muslim girl and woman should do it in obeyance of commands of the religion. YOU ARE TO PRACTICE YOUR RELIGION ACCORDING TO THE TEACHINGS OF THE QURAN AND HADITH OF THE PROPHET (PBUH). THE RELIGION WILL BE BEST UNDERSTOOD BY NON MOSLEMS THROUGH THE WAY YOU PRACTICE AND CONDUCT YOUR SELF. “One of the main reasons for the hijab ban in a country such as France is a concept known as secularism. (Secularism is a system in which government functions with little or no connections to religion or religious institutions. )” In other words, systems were religion is unimportant and place second to every one’s life. Were society is decadent and empty. Were God plays second in command? In the United States secularism, is downplayed. In the United States we don’t mix state with religion. Separate entities. In other words, we have secularism undercover. Where is the real oppression; to wear a hijab by choice, humility and submission to ones Lord and Creator or to choose what society and few Muslim women that are confuse and overwhelmed by this society expectations? Who is your Lord? What is your religion? Who is your Prophet? Allah subhana wa tallah, Islam and Prophet Muhammad sallah lahu alehym wa salam. If you answered these questions accordingly you are a Muslim. The real oppression comes from within wearing hijab was never questioned. The Muslim women should to read Surah 24:31 and stop taking it out of context. Some of them say that this ayat is miss interpreted and others saying is obligatory to wear niqab. (This will be another subject) Get it together sister, it says what it says. No if or buts. Is plain and simple, cover your chest, head, and dress modestly. “Oh Prophet, tell your wives and your daughters and the women of the believers to bring down over themselves (part) of their outer garments. That is more suitable that they will be known and not be abused. And ever is Allah Forgiving and Merciful.” (Al-Ahzab 33:59). All trough out religion history the Jewish, Christian and Indian (that profess Hinduism) women have cover, dress modest and had not question it. Until societies introduce new styles, magazines, television and beauty was given a new standard. Then women started questioning themselves. You never see anything wrong with your life, the way you talk, walk and the way you dress until someone brings it to your attention. Then questioning what is more important, dressing for the sake of Allah subhanna wa tallah or dressing to conform to society. What will be your choice? Allah subhana wa tallah, demands of us total submission. He tells us to obey the Qur’an and to follow the example of our Prophet. What other proof do you need? As a Muslim what more proof do you need? We hear more of women stating that the verses in the Qur’an are not interpreted correctly. When in fact is cut and dry and doesn’t give way to any other interpretation. Think about this: you are walking down the street and a woman, not wearing a hijab, salaams you, what do you do? Just say “Walekum” or give her the full greeting she deserves? How do you know she is a Muslim sister and not a non-believer? You don’t. We need to study the Qur’an, the Sunnah of our Prophet and other good sources of Islamic teachings. We have to teach our daughters to love Islam and their Hijab. I agree with the concepts of modesty and covering up , but I would just like to say that I’m from nyc and i see many women who are covered yet their behavior with non-Mahram men is haram and then there is the woman who isn’t covered with hijab but wears decent clothes has a job and is good (does not do zinna) and prays 5 times a day. So honestly, if you’re going to wear a hijab don’t be a hypocrite and do these things and wear it the same time. It’s a disgrace. And ladies please wear it the right way…don’t just tie your head scarf while the rest of the body is covered with clothes that are not even modest… that makes no sense…. Thanks for your reactions … I still do not see too much of the Prophet’s saws compassion and insistance on creating brotherly love here though – did I miss something ? How can a person even hope to profit from obeying Allah’s dear commandments only externally – and even flee his task of promoting His Word amongst those who crave for its authenticity (because all they have tasted so far was imitation and twisted things meant to control their minds and actually prevent them from getting real contact with their Creator, who has a right to their hearts and devotion) by running away to a country where observing so and so external rule is easy ? Really ! Is there someone who does care enough to care in a visible way ? Can hijabis not cross the border to touch a non hijabi’s heart without losing her self respect ? Is intention not of any value then, because external behaviour is much easier to measure “hey – I am complying to what Allah asked of me, leave me alone” – well I say, I cannot comply to rules that make it impossible for me to live out my love for Islam, and no I do not have a muslim family where I can find a satisfying role serving inside the house, and no ! I do not trust that every man who says marry me, I am a good muslim, I will give you a home where you can shine without having to face the dangers of the outside world and its temptations … is he going to fulfill my heartfelt mission of showing Islam to those who have no idea of it then ? No, heis going to go to his job, get his pay and do his prayers at home in one big series, and he is not going to work in his sunnah outfit either, and he is not going to preach to his colleages either because he knows at a certain point he is going to face questions he may not know how to answer. If he wants to have a good feeling about himself at all, he may go do da’wah in another city once in a while, where his collegues don’t know him, and he is not going to focus on the Dutch there anyway, but on the youngsters from muslim background, pushing onto them the responsability he does not know how to carry : Islam is meant for the whole world population, but how on earth can we carry it into the hearts when radicals have spoiled the entrance ? By stepping over the hurdles that prevent us from doing so, I honestly feel – and if so many brothers and sister feel that is too much risk to take, I do not mean they should – everyone should follow his/her heart felt mission. Mine is clear to me, I am just writing these lines to tell you all about it, and to remind you the mercy our Prophet saws showed to so many people, considering their state of mind when judging their actions … but then he was a man, and I have not found details on how women spread Islam yet before the hijab was descended to the muslim community in Madinah, I just cannot imagine they kept silent about what made them happier than anything else. To B. from NYC : yes, I agree, consistency is what it’s all about – it is not just the terrorists with guns and boms, hoping to get to paradise cheap by one act based on one line taken out of context, that are spreading a negative image of Islam, but all those who say “hey, studying the contexts is too much of a job, let me be well wrapped (o.k. it sticks to my skin but I did not read about that detail), get my social allowance and hang out in the streets shopping with my girl friends because I cannot get a job and my three muslim husbands have quit me one after the other for a younger version of me, my kids are in school and I am free now – please do not overcharge my mind with anything else, cauze I cannot take any more, praying is already hard enough” … even the muslim based women suffer – is that how Allah wants things to be ? Read some Malek Bennabi, please – social responsability is the basis of Islam, not saving oneself first and letting the rest perish – if that were so, The Prophet saws would not have forbidden ascetism. Show some heart, each in his/her own way, please ! and also : we need to stop seeing the animalistic drives as the only thing that exists in the human soul, and let our lives be controlled by the prevention of its workings, selling every other talent we have for this sole purpose – don’t you know that it is impossible to avoid someting when thinking about it all the time ? Ever heard of positively directing your mind to the service of the lost ones ? Of people who went to help set up a community that gives some social structure to the lepers, knowing very well he/she would also get the sickness and die from it, eventually ? Was it pureness of heart or pureness of skin that counted there ? I love hijab, and I love to serve my Lord, and when people hate the effect hijab calls up in their emotions, but I see they would love to hear more about the real Master of the Universes, and will end up loving the hijab after gaining true understanding, I am willing to sacrifice my so-called external guarantee for the much stronger inner one I feel and have to deal with. An unhappy sister running around in a cloth hijab that spells failure to accomplish her real task, is not what I want to be, Allah protect me from straying from His path by following advice that lacks the spiritual depth I need to know that a person with real love and understanding is giving it to me, as a mercy from my God who is His God, from heart to heart – mercy is what I miss in the comments that stress “this has been said” – without consideration for time nor circumstances. I just do not buy it. I only take what Allah puts into my heart as a burning proof, and that is what I willfully and wholly obey, on the spot. His work with me is a going on project, as with all of us, and I still am to meet the first believer who will state “hey, I am perfect now”, because in saying so, he is proving just the opposite. Salam to all, hope to have touched at least one heart who feels the care I bare and want to put forward as an option of living our mission. Your words have resonated in my heart and I understand how you feel. Please continue on your righteous path. my wish has been fulfilled: one soul who has seen and understood – Allah swt bless you and those you meet, may his great love and compassion find an ever growing fertile soil in our hearts and lives and melt all the spiritual ice around us, as we try to serve him wholly and let him guide us in every one of our steps. Barakatoullah ‘aleykoum wa ‘alayna and to all who are looking for his grace, wherever they may be, whatever burdens they may be carrying. Dear Allah please teach us how to be your servants in all humility, and to distribute your word freely amongst the hungry. Now here’s nice question I would like to see people respond to: what if a single mother of adolescent daughters who are quite judgemental of Islam’s regulations, and not quite aware of God’s existence yet, get totally crazy when their mother who, in the middle of their lives, happens to see the big light in Islam, and wants to start wearing hijab out in the streets where all their school mates see her and will start annoying them at school for that ? Do these girls have to suffer from their mum’s desire to comply to what she perceives as right, in such a way that it renders them sick of heart and might even prevent them from even wanting to hear another word about Islam, ever … or is it better if she backs off a while untill her choices will not influence her daughters’ life as much any more, giving her more chance to let them discover Islam from the inside first ? What if the girls get really fed up and run away to go live with their father, who does not watch them at all, letting them run the risk of getting into bad friends circles because they feel unsuported and abandonned by what they perceive as their mother’s utterly selfish behaviour – caring more about her own “salvation” based on outward sign than about their inner balance ? I see lots of women lose their children when they convert, and it is usually due to the heavy punishment society or their own family members place on the veiling matter – this of course tends to increase the general prejudice against Islam around here, and does not really seem to help in spreading the inner comprehension of Islam … how have sisters who were confronted with this situation actually tackled this in a way that shows mercy to those who yet have to learn so many things in life ? Like you, I have had a few opportunities for developing stronger communication with my daughter. 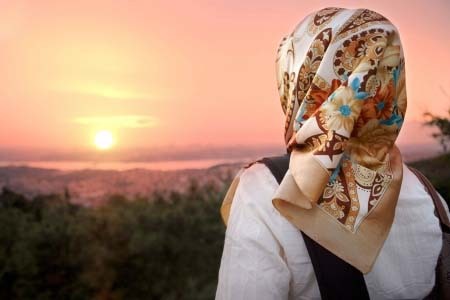 I started covering my hair when I discovered that I had breast cancer and then started to learn about Islam after I read in the Torah that the Prophet Muhammed (saw) was mentioned in it as well as the prohibition of usury. I would see a mescen (spelling?) and ask my daughter on whether she should would want a man to know her for her inner beauty or for the amount of skin showing,…and explain why modest dress is the basis of a sound society. Then, when we would hear coarse language, I would ask her if that person would ever be considered an intellect,…and the importance of proper manners. Upon seeing tattoos,….same thing. On seeing genders mixing we would discuss the explosion of single parents and destitution,…the importance of personal safety and STDs…. For a while when I picked her up from grade school, I tied the hijab to the back of my head and let the ends flow over my chest so she wouldn’t feel embarassed. (I sensed that looking like I have a fatal attack of breast cancer leading to baldness was less embarassing to her young mind than a Faith in Allah.) Eventually, with the blessing of my husband, I wore the full hijab on her final day of school and sat in the car while he retrieved her in person so that important imcremental steps could be taken. My methodology is not an instant success story but one of many increments. As we witnessed things, I would ask her for her opinion and how the little things impacted the greater society. I learned quite a lot by listening carefully and that, in itself, deepened our bond. While she intends to be a movie star, I know in my heart that I am teaching her fundamentally how to live so that she will know how to develop her own proper life. (Proverbs 22:6 Train a child in the way he should go, and when he is old he will not turn from it.) Your daughters are listening to you even when you do not speak and I hope that you find comfort in knowing that they are looking to you for guidance—even when they seem to push you away. I understand your situation and I hope that this note can help you just a little. I only said shahada and married last month but so far, insh’Allah things will continue to go well for all of us. Sisters keep the Hijabs on. Allah(S.W.A.T.) will take care of you!! Just trust and believe in him. However, it takes work. This is my fisrt time of reading articles on the iqrasense web site.I enjoyed the write ups which are rich in content. iwant to use this opportunity to pray that the Allah reward iqrasense abundantly in her efforts to propagate the course of Islam the world over. What is in the heart and being a sincere worshipper of Allah, and praying sincerely is more important then wearing eye-shadow or not. This is a matter of personal taste, and has nothing to do with Islam and the Koran. I pray five times a day, read the Koran, and love Allah with all my heart. I wear eye-shadow, and Allah is not condemning me for it, since Allah accepts me for who I am. In Iran they destroy womens’ faces for wearing make-up. How far should this go. I think it is disgusting and totally but totally opposing the Koran. If one does not want to wear eye-shadow, that is ok, it is ok to look natural, but it is not a Koranic rule. People should not abuse the Koran to be against make-up. It is better to say then, that one does not like make-up because of personal taste. The Koran should not be misused. It is a book that I estimate highly, and find comfort, consolation and peace of mind from. I hope that sisters in the Islam won’t judge eachother. It is Allah who judges, not us.If you don’t want to use eyeshadow, it is totally ok with me, no problem, but it is not a rule. Men don’t approach me at all, because I don’t let them, without wearing hijab, and wearing eye-shadow. I pray to Allah on my way outside, and it is time that women stand up for themselves and not allow men to flirt with them, that comes from inner attitude and strength and imran. Don’t get me wrong, I am not against hijab, but sometimes women should be stronger and not allow men to treat them badly and not allow them to flirt around with them when they want to. Women with faith in Allah should focus on other things, and praying can help. I pray Allah will bless each one on this forum, because i am sure that all of us write things with the best intentions, but we see that everyone is different, and so do our opinions differ maybe depending on the culture where we are raised in. What is most important is to bless eachother and accept eachother and share Allah’s mercy. Atthe same time, now that burka’s are forbidden, the women that do cover themselves should have a right to do that I think. but maybe you can cover up without covering the face. I am sure Allah is not going to look bad on that. People should not be made scared for Allah’s wrath about these kind of things. Allah is much wiser then that. So many women are made afraid. That is not necessary I think. Allah is full of compassion and mercy, there are many scriptures in the Koran about that. you need to find empowerment through your skills sister! There are many sisters who could benefit from your beauty/fashion industry skills for when they need to get made up for halal segregated type events. Have girlfiend get-togethers, get made up together. Switch up the clothing. I try to wear my fun ‘good’ clothes for home. and dress up when visiting girlfriends in private gettogethers bridal showers etc. ou can even hold private classes for teaching them your skills, make some money on the side. Or teach young girls useful fashion beauty stuff so they don’t haveto resort to self-esteem destroying beauty mags etc or follow unhealthy beauty advise yanno? Empower, teach and be empowered! All of this comes from sincere Dua, salah and sabr (wich I think is a more comprehensive term than just patience). Have you heard of DIscoverUlife, ProductiveMuslim, Farhat Hashmi’s Al Huda institute or Megan Whyt’s Wives of Jannah ? Google them, they have interesting stuff to to connect through. Remember Quran in a cure, read some authentic tafseer of surahs like Surah Rahman. Also an article by Shaykh Waleed Basyouni on hardships in life on the Muslim Matters website is amazing. SORRY I DIGRESSED, the reasons i do not wear are 1] live in small area with some not so nice people so am scared! 2] the man i am married to told me if i try to wear out with him or out at all he would burn it off me if that only way to get it off. yes i want divorce but he not sign so can and i cannot leave and b apart for 2yrs as have very complex medical needs and been told cannot get all help i need until have my divorce. SO PLEASE TELL ME DOES THIS MEAN MY FAITH IS WEAK???? ?